How to integrate Shopify or BigCommerce with Etsy Marketplace? Etsy is a marketplace well known to the sellers and manufacturers of handmade products. Apart from that, Etsy also allows you to list your unique or antique products of Shopify and BigCommerce shops. It is easy to get started to sell on Etsy due to the free registration and nominal listing cost. Listing your specific collections and categories of Shopify and BigCommerce on Etsy will not only increase your sales revenue but also help you to spread your goodwill among the loyal customers of Etsy marketplace. Here is how you get started. 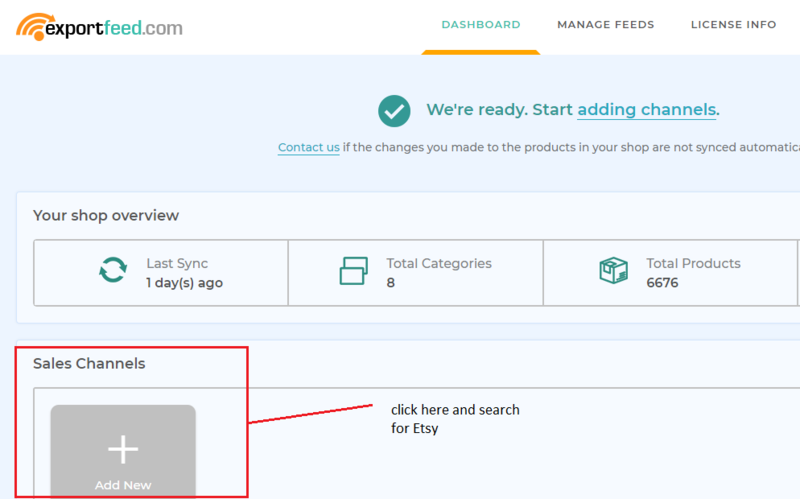 Go through these simple steps to create feeds and upload in Etsy from your Shopify store or BigCommerce Store. 3. 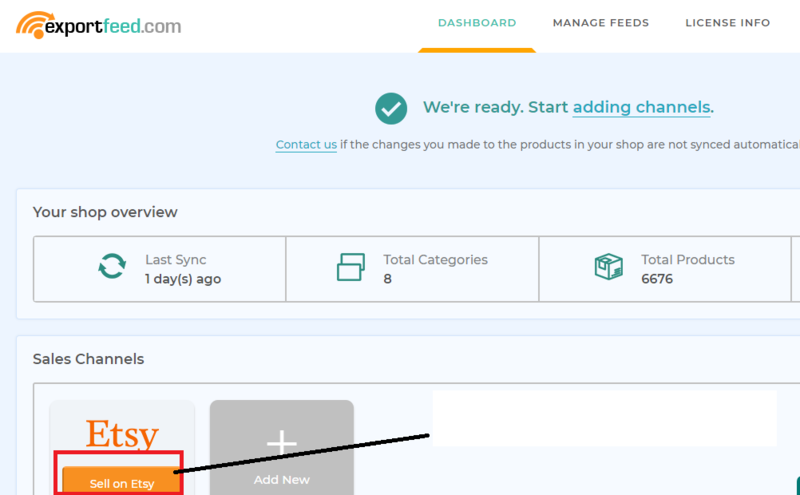 After you add Etsy to sales channel you can CREATE AN APP and connect our App with your Etsy store and you can start the feed creation process for that you need to gather the information needed. For that click on sell on Etsy. 5. 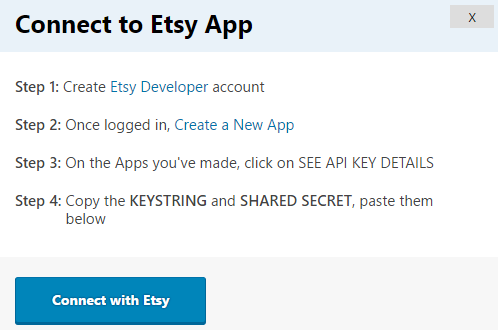 After you created an App put the credentials (keyString and shared key) and click on Connect to Etsy. 6. 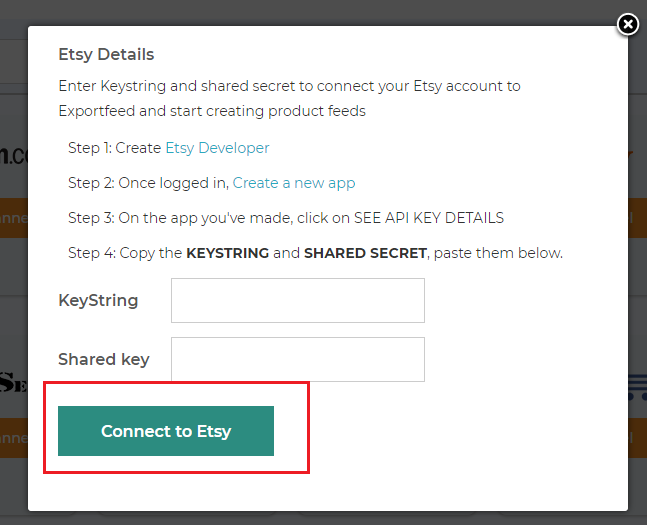 After you click on connect to Etsy, the dialog box from Etsy will appear which allows you to connect to Etsy. Click on Allow access to connect to Etsy, and once the Etsy connection is successful Etsy will appear your sales channel. 8) Now will be now redirected to Feed creation process. Select your local category and Etsy category as shown in the figures below and proceed to get feed. 9)After that give your feed a name and click on Get the Feed. 10) After the feed has been created go to Manage Feed and click on Submit products to Etsy link. 12) Once the products have been successfully uploaded go to your Etsy Store>Shop Manager> Listing to see the listing in your Etsy store. Note: Please make sure that when you set up your Etsy account, you complete your payment and shipping information. Also, please create a Flat shipping profile on your account as that can only be used by ExportFeed services due to the limitation on Etsy API. Feel free to contact us in case of any further concerns as we’re only an email away.